• What is endodontic treatment or Root Canal Therapy? • What are the signs of needing endodontic treatment? • How does endodontic treatment save the tooth? • Will I feel pain during or after my root canal? What is endodontic treatment or "root canal therapy"? Endodontic treatment means to treat the inside of the tooth. The term derives from the Greek roots "Endo" which is "inside" and "odont" which is "tooth." Your tooth consists of an outer portion, a white enamel and a hard layer called the dentin, and an inner portion of soft tissue called the pulp. The pulp contains blood vessels, nerves, and connective tissue. This pulp creates the surrounding hard tissues of the tooth during development. 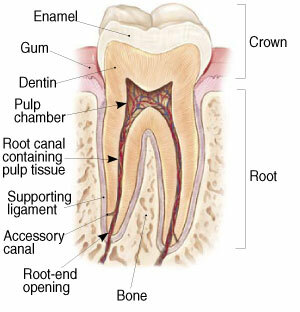 The pulp of the tooth extends the top of the tooth down to the tip of the roots. The pulp is important during a tooth's growth and development. However, once a tooth is fully mature it can survive without the pulp, because the tooth continues to be maintained by the tissues surrounding it. Signs that you may need endodontic treatment include pain, sensitivity to heat or cold, tenderness, discoloration of the tooth, swelling, drainage and tenderness in the lymph nodes as well as nearby bone and gingival tissues (gums). Sometimes, there are no symptoms. An Endodontist, a Root Canal Specialist, will remove the infected pulp, carefully clean and shape the inside of the canal, then will fill and seal the space. Afterwards, you will return to Dr. Simonsen at our Beaverton dental office, who will place a crown or other restoration on the tooth to protect and restore it to full function. After restoration, the tooth continues to function like any other tooth. Will I feel pain during or after my root canal? Root Canal procedures are usually performed to relieve the pain of toothaches caused by pulp infection. With modern techniques and anesthetics, most patients report that they are comfortable during the procedure. For the first few days after treatment, discomfort can be relieved with over-the-counter or prescription medications. Follow Dr. Simonsen or your referral specialist's instructions carefully. Your tooth may continue to feel slightly different from your other teeth for some time after your endodontic treatment is completed. However, if you have severe pain or pressure, or pain that lasts more than a few days, call our Beaverton dental office.